Most of these outside-the-box jobs don't require extensive training, and are also scalable as businesses, allowing you to build on your initial success. Jobs and businesses covered include cricket and maggot farming, environmentally friendly burials, making and selling solar-roasted coffee, daycare services for handicapped children, and many more. Each chapter features a "where the money is" section on how to scale-up and be profitable. The author writes a popular website and email newsletter on unusual ways to make money. 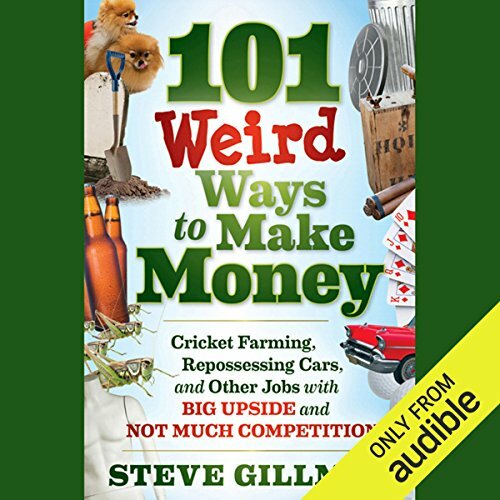 Whether you're seeking a new career, an additional revenue stream, or a new business idea, you will want to discover 101 Weird Ways to Make Money. ©2011 Steve Gillman (P)2012 Audible, Inc.
Why would you read all of those links? Would you try another book from Steve Gillman and/or Donald Corren? The narrator's voice is ok and engaging. Each of the 101 items has a couple of web links at the end. The narrator reads every letter of it. WHY? WHY? Why not just include all of the links in an attached PDF. Example: You can find out XYZ at "h t t p s : / / h o w t o d o X Y Z . c o m / w i k i / 3 4 s g t / s o m e o t h e r s t u f f . h t m l"
Arg. Its driving me crazy. If you're looking for a source of good and/or interesting ideas, this may fit the bill. The author not only gives the business idea and overview, but also provides resource listings at the end of each discussion in order for you to do more research (keep a pen and paper handy). He and his wife have tried many of these businesses and have had a measure of success, so you get a bit of comfort knowing he's coming from a place of experience, however limited. While some of the ventures aren't my cup of tea and, mostly likely, I'll never try them, it still sparked my imagination and based on things I'm familiar with or am currently developing, was a springboard to new and different ideas that I may not have come across without the inspirational seed. Sometimes you just need a little creative nudge and that's the real value of this audio book to me. It's been about a month since I've listened, so in reviewing the narrator, I can't give a truly 'fresh' view, but I had no difficulty in sitting through the reading and I don't remember any glaring pronunciations or habits that made me want to pull out my hair or my ear buds...but then, I'm the type of person who can sit through terrible narration if the material is worthwhile. Still, I hope this will serve as some sort of a guide for you if you're on the fence about getting it. He provided 2-4 credible sources per chapter. each chapter is dedicated to a job, obviously a weird one. This book is educational and it truly owns up to the title. I hope to make money off off his advice, I guess that is the true test. A good substitute for a Google search. Little to no new or difficult to find information in this book most resources would just as easily be found with a bit of internet research.